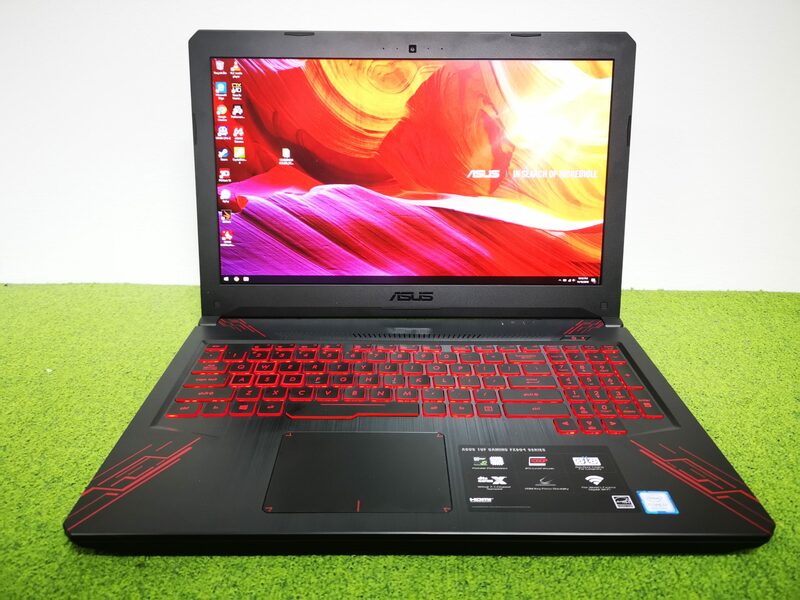 Just about 7 months ago, we were introduced with the ASUS TUF Gaming FX504 laptop. Just purely on the specifications and design, the propositions of the series of gaming laptops were great. It’s an affordable option for gamers who play graphically demanding games. Moreover, they were also equipped with latest Intel 8th Generation Core processors, which also brings about a slew of new features to the laptop. It’s a gaming focused notebook computer that is hard to not recommend. However, it is more than just basic specifications that will determine the performance of a notebook computer. Today, we will do a deep dive into various features and performance of the ASUS TUF Gaming FX504 to get a better understanding of the system. The design on the ASUS TUF Gaming FX504 is rather toned down from the usual high-end gaming fair. To make it an affordable option, ASUS left out all those features which were unnecessary, such as RGB lighting and additional macro keys on the setup. The lid of the machine is also created rather uniquely, with interesting red decals which represented the TUF Gaming branding. Coupled with the grooves that were purely used for aesthetic purposes, the overall look of the TUF Gaming FX504 is well integrated with a hint of artistic depth. While RGB may be excluded, the ASUS TUF Gaming FX504 still had a red LED backlit keyboard to make it a practical gaming machine at night. These keys are scissor-switched, and have a 0.25mm keycap curve and 1.8mm of travel to simulate tactile feel. The keyboard layout is also rather standard, and it was very easy to get used to. Our only gripe was that the directional keys were somewhat forced into the real estate of the numkeys, which gamers will have to get used to before always accidentally pressing the wrong button in their games. On the right, there was only 1 x Kensington Lock Hole. ASUS also took advantage of the latest 8th Generation Intel Core processors, which brought hexa-core compute capabilities to notebook computers. Such a configuration extended the possibilities of compute, setting the ASUS TUF Gaming FX504 on a stage to be potentially a great gaming machine. Moreover, the new processors also supported a higher DDR4 RAM speed of 2666MHz, up from the usual 2133MHz or 2400MHz. This should also bring about some improvement in system performance when comparing this notebook to one from the previous generation. At the same time, ASUS also did not have to worry about the integration of an additional wireless card, as the new processors already have an integrated Wireless AC solution with Gigabit throughput designed within. The FX504 also supports DTS Headphone:X technology, which can simulate 7.1-channel audio from a stereo output. This can be done either on a headphone, laptop speakers, or external speakers. Moreover, different audio effects and enhancements can also be configured within the DTS Studio Sound Software that is preinstalled on the system. Users can also personalize the laptop’s audio output sound profile through the equalizer in the software. If you realise, based on the CPU-Z screenshot, the SKU that is available in Singapore is only included with a 1 x 8GB DDR4 RAM. This only allows the system to run in single-channel RAM configuration. It would be sensible for users to further include another 8GB RAM to enable a Dual-Channel setup for better memory performance on the system. Looking into the details, we also realized that the ASUS TUF Gaming FX504 utilizes a Micron 1100 3D NAND M.2 SATA based SSD, as well as a Seagate ST1000LM035-1RK172 1TB hard drive. Even though the configuration is considerably good for a gaming system, where we were able to have a fast SSD for the OS and games, and a main hard drive for data files, but we thought that it would be even better if ASUS had included a NVMe based SSD instead. For our tests, the power profile of the system has been set to the high performance. This allows us to understand the full potential of the system. Comparing the overall system performance with PC Mark 10 Extended test, we can see that the the FX504 falls in the 25th percentile of notebook computers tested within the PC Mark 10 Extended benchmark. Oddly enough, the test suites which are largely CPU dependent are not achieving the scores that are expected, when compared to other systems on the database with similar specifications. We had to probe further by looking at the performance of the CPU individually. To single out the CPU, we used Cinebench R15’s multi-threaded test to understand its performance. Even though we managed to achieve a score of 883cb, which was considerably high for laptop computers, it was lower than expected when compared to systems of similar specifications online. We had to probe further to understand more. Oddly enough, during the benchmark of Cinebench R15, the CPU fails to enable its Turbo Boost feature, even though it has got thermal capabilities to do so. Therefore, the CPU remains as 2.2GHz, instead of the boost clock of 4.1GHz. This isn’t an issue of the cooling solution’s thermal capabilities as well, as the temperatures were considerably low during the benchmark. It seems to be an issue of how the system is configured to react to different loads with various P-State profile. Hopefully, ASUS would be able to issue a fix to this. Another interesting point on the FX504 is that its SSD performance drops quite significantly when it is near to full capacity. As such, we can see that the write performance of the drive does not go beyond 200MB/s, even though this drive is rated to have a write speed of 500MB/s. In our test, as most benchmark files have already taken up significant space on the SSD, the performance was affected. If you want to play the latest games at medium settings on Full HD resolution, the ASUS TUF Gaming FX504 fails to achieve the kind of performance to provide smooth 60FPS and above gameplay. However, if you game mostly on less graphic intensive games, such as DOTA 2, this gaming laptop will work well. Until some of these issues that have been mentioned are offered a fix by ASUS, it’s hard to recommend the ASUS TUF Gaming FX504 to any gamers. Hopefully, the newer ASUS TUF Gaming FX505 has already got all these issues figured out.